To make ketchup: In a medium saucepan, over medium heat, combine ketchup, blackberry preserves, Cabernet and salt. Bring to a gentle simmer. Cook 4-5 minutes until slightly thickened. Remove from heat. 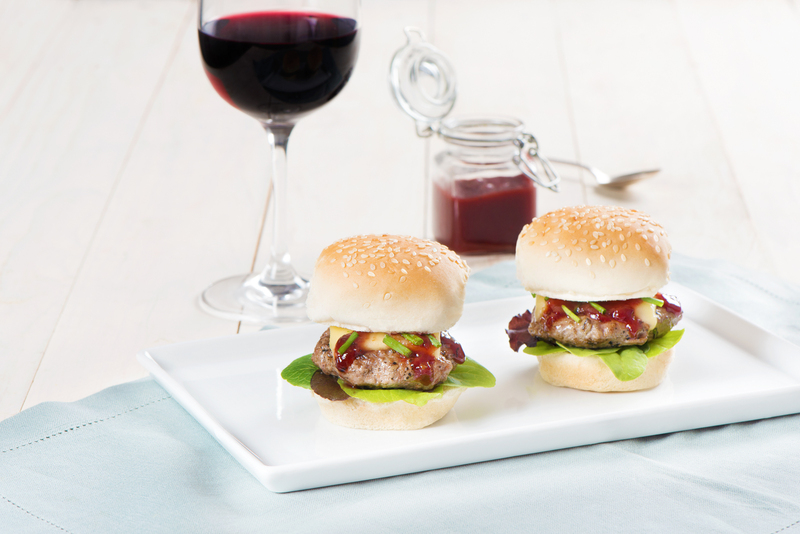 To make lamb sliders: In a large bowl, combine lamb, Cabernet, garlic, cumin, rosemary leaves, kosher salt and pepper. Form into 12 slider size patties. Heat an outdoor grill or grill pan over stovetop on medium-high heat. Lightly brush patties with olive oil. Grill patties, flipping once, about 2-3 minutes per side for medium rare, or to desired doneness. During final minutes of grilling, place cheese on top of each patty and melt cheese. On each bottom bun, place greens, then top with a patty. Top each patty with chives; drizzle with ketchup, Close with top buns. For a printable version in PDF format, click here.